The upperparts on juvenile Ring-billeds take on a vast array of brown, black and tan patterns. But they often show a silvery-gray, to some degree. This silvery gray coloration is not acquired via feather replacement, but rather, is inherent in juvenile plumes. Juvenile Ring-billed Gull. Blue Island, Illinois. 04 July 2013. These gray feathers are not 2nd generation (i.e., formative), but rather, juvenile (=1st basic). Looking closely at the other wing coverts and scapulars, you'll notice they too have grayish centers and bases as well. Juvenile Ring-billed Gull. Tinley Park, Illinois. 26 June 2014. Showing a couple of lesser coverts with gray coating, and almost the entire row of greater coverts with a silver-gray (juvenile feathers). Juvenile Ring-billed. East Chicago, Indiana. 27 June 2015. Notice on the open wing above the entire row of greater coverts with a silvery base. This is complemented by a similar color/pattern on the inner primaries and outer secondaries - all 1st basic, juvenile, feathers. I've wondered why some juveniles show this gray color more than others. The simple answer is "variation". It does however seem more common as we get later in the season (late July and August). It could be birds that fledged a bit later develop adult-like colors (as is the case in late molters in 2nd cycle large white-headed gulls). Juvenile Ring-billed Gull. Tinley Park, Illinois. 16 June 2015. The bird above is remarkable in that it shows gray on the edges of the two lower tertials in mid-June. Juvenile Ring-billed. Chicago, Illinois 26 July 2013. Intricate gray centers to most of the greater coverts, and again, along the bases of the lower tertial edges. Will this gray widen as the edges begin to wear? Juvenile Ring-billed Gull. Chicago, Illinois. 26 July 2013. An atypical individual with white primary tips and boldy checkered upperparts. Still, grayish/white centers can be seen on many of the lower scapulars and wing coverts. Juvenile Ring-billed Gull. 26 July 2013. A unique "ghost-type" with silvery greater coverts and whitish triangular centers to the scaps and lesser/median coverts. It should be apparent to the careful observer when "true" post-juvenile gray feathers have molted in. Ring-billed Gull undergoing prefomative molt - no longer juvenile. East Chicago, Indiana. 24 August 2015. Only a few juvenile scapulars remain (the 3-4 lower feathers with brown centers). 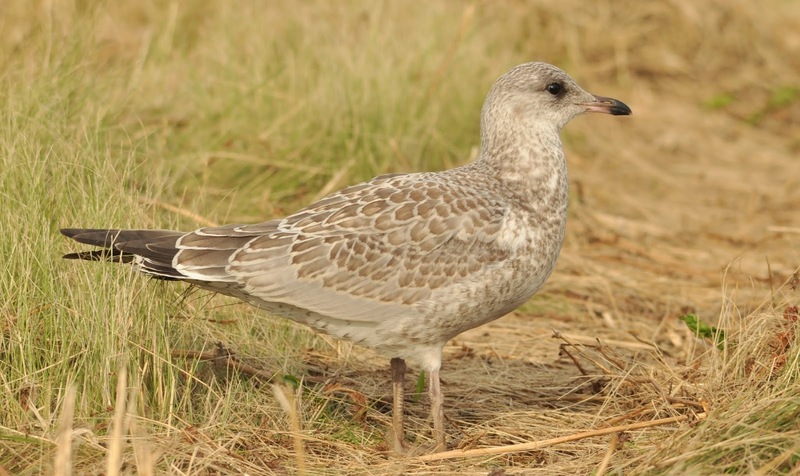 The upper tertials are also juvenile, while the lower 2 are entirely gray with white edging. These lower tertials and gray scapulars are 2nd genration feathers acquired via a preformative molt - a partial molt contained in the first plumage cycle. Note though that the greater coverts with their silvery-gray coating are juvenile feathers. Mostly post-juvenile (formative) scapulars. Several lesser median covets have been molted (gray). But notice how the juvenile greater coverts are mostly brown with very little hints of gray. St. Joseph, Michigan. 01 September 2012. Ring-billed Gull in formative plumage. 31 October 2012. Chicago, Illinois. Upper tertials, all the visible scapulars and many median/lesser upperwing coverts have been molted via the prefomative molt. This individual is rather extreme for any formative Ring-billed Gull in its first calendar year. The gray band of greater coverts are juvenile feathers. The back shows a mixture of brown juvenile scapularss and gray formative scapulars. East Chicago, Indiana. 24 August. 2015.